In honor of Black History Month, Fox Chase proudly recognizes the work of Camille Ragin, PhD, MPH, for her research on cancer disparities affecting populations of African descent. Among many accomplishments, Ragin, an associate professor in the Cancer Prevention and Control Program at Fox Chase, founded and leads the African-Caribbean Cancer Consortium, which furthers the study of genetic, lifestyle, and environmental cancer risk. 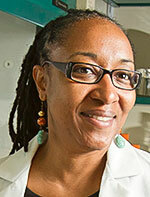 She has published several peer-reviewed papers on disparities and a variety of cancers. Most recently she published in the journal Cancer about a link between African ancestry and poor survival rates in patients with head and neck squamous cell carcinoma. She is active in several organizations that connect underserved populations of African descent to critical healthcare and educational services. These include the Mayor’s Commission on African and Caribbean Affairs, the African Family Health Organization, and the Elise Joseph Foundation. In order to advance understanding of cancer risk, Ragin established the Cancer Prevention Project of Philadelphia (CAP3), a cancer prevention registry that enrolls persons with no known cancer diagnosis. She is also doing her part to train the next generation of African American scientists. Every year she serves as mentor and trainer for two students recruited from historically black colleges. Ragin has earned many notable awards, including an International Community Service Award, and several Citations from the City Council of Philadelphia. In November 2016 she received the American Cancer Society’s Cancer Control Award, for her unique contributions to cancer education and training. Camille Ragin is a pioneer, and Fox Chase is proud to have her as part of our faculty.